Flying in Anthem is just like riding a bike. When you clamber into your Javelin, acquainting yourself with the magical momentum of airborne movement, your first tentative steps will send you zooming into walls and falling thousands of metres in an uncontrollable fiery death spin. Or perhaps that’s just how I learned. Anyway, with time, you’ll gain the confidence necessary to perform outrageous tricks, accelerate to breathless speeds, and impress your friends. Only this time, unlike those heady days of failed wheelies at the park, you’ll save humanity in the process. The thrill of flight in Anthem’s mech suits is intoxicating. Missions typically commence on the edge of a precipice, urging you to attack the glittering horizons of this beguiling world head on. With a jump and an explosive boost, you’re away, and exhilarating, drug-like freedom follows. It won’t be long before you feel comfortable with your Javelin, but you’ll need to keep an eye on your heat meter. Boost over-enthusiastically, or speed too high without stopping, and you’ll need to cool off or throttle your energy use by plunging downwards. Alternatively, if you’re anything like me, you’ll plummet unceremoniously to the ground in a heap of scrap metal, ordnance, and shame. Icarus who? Your heat meter prevents you from being an Iron Man-esque god, but that’s a good thing: it forces you to think even when you’re in the throes of a tough battle. For instance, fire-spewing wyverns will cripple your suit in flight, forcing you to dodge and get some quick shots away. Managing your suit, flying, and keeping your enemies in check feels like juggling on a tightrope, and it’ll take hours of practice before you master all the skills your Javelin offers. Objectives in the style of ‘scan the thing’ and ‘secure an area’ might not sound exciting, but they are the springboard for you to show off your abilities as you cultivate them. After several hours with the game I, of course, did not accomplish this. That said, I have heard it is possible to complete some missions without ever touching the ground. The breathtakingly gargantuan world of Anthem facilitates feats like this – and for the less-skilled, there are still plenty of empowering moments on offer. I did manage to dive into the water near a group of enemies and rise triumphantly from the other side, finishing them off as they stared in astonishment. It’s a feeling of sheer power I haven’t felt as a robot pilot since Titanfall 2. Anthem’s massive playground is not just about its beautiful surface of impressive ruins and verdant greenery, but its subterranean depths, too. The cooling water imbues your suit with a permanent boost as you blast through cave networks of deep blue. By comparison, games like Destiny 2 and The Division feel glued to the ground, and limited for it. All that said, your flying experience will depend on your choice of Javelin: Storm, Colossus, Interceptor, or Ranger. Each feel powerful in their own way, but they also combine to make sweet, sweet, baddie-bashing music. The Ranger suit is an all-rounder and therefore best suited to solo play. You’ll start the game with this class, but the relatively high speed capabilities of this suit and its access to all of Anthem’s heavy weapons makes the Ranger a good choice both alone and with groups in most cases. 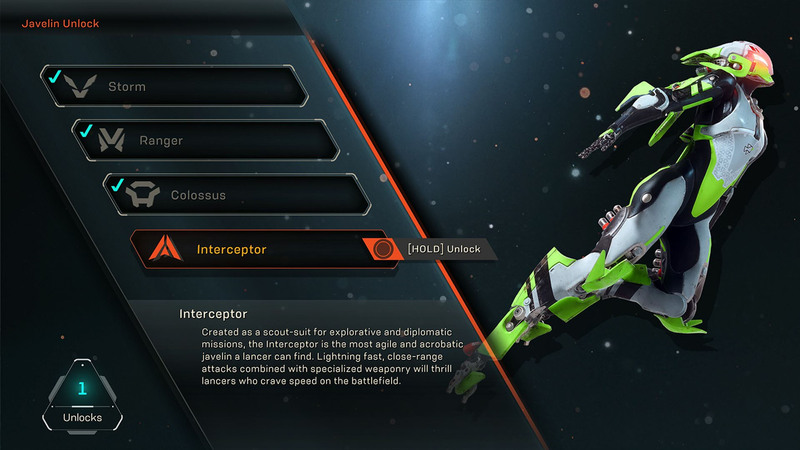 The Interceptor, by contrast, is the toughest of Javelins to solo: its low damage threshold will make things hard going, but the ability to chain dodges and slashes of its double-bladed daggers before whooshing to safety feels phenomenal. Anthem’s stellar animations shine here, as the Interceptor performs a dazzling pirouette from above to land the killing blow. The Storm is an elemental sight to behold. Powered by ancient tech known as ‘seals’, your magical kinetic abilities and absence of heat meter mean you can rain down ice, fire, or electrically-charged pain on your enemies. With Glacial Beam and Rime Blasts equipped, I can freeze targets to the spot before dashing in with a melee move on the ground. Then I get to savour the sound of a combo – a satisfying ding, like that of an M1 Garand reload. Lastly there’s the Colossus, a heavily-protected, lumbering tank. Without the agility of the Interceptor and Storm classes, this Javelin erects a shield in a flash instead of a dodge. The pleasing ‘chunk-a-chunk’ of its Ordnance Launcher is only matched by the taunting battle cry that attracts enemy attention. That way you can soak up the aggro away from your team and charge up the melee shield, slamming it down on bad people with earth-shattering force. 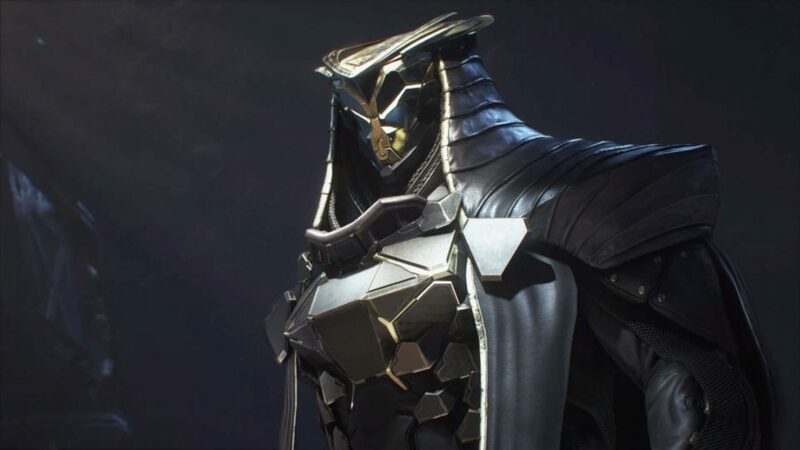 You’ll be unlocking new Javelins at levels 2, 8, 16, and 26, but this variety in approach is only the beginning: tinkering with seemingly endless opportunities for different Anthem builds should keep you busy long into the endgame and beyond. For each Javelin, you have customisation options for your primary weapons, melee, focus, throwables, and heavy attack. Each item has an ‘inscription’, a small bonus effect that can compliment the rest of your build. There are also Destiny 2-like random rolls, so the same weapon can have different perks attached. It might not have the complexity of Warframe, but Anthem certainly has depth when it comes to tweaking your mech. Numberphiles will be licking their lips at the prospect of what lies beneath the suits, but BioWare also evidently understands the importance of showing off on the surface. The Forge is the place where you choose and kit out your mech, and there are even more cosmetic choices than there are weapon changes to make. From beat up and muddied to pristinely shining, you can choose the cleanliness of your gear. You can change your helmet, torso, leg, and arm equipment. There are arrival and victory emotes to enjoy. And there are primary, secondary, and tertiary soft colours, so you can tweak your appearance down to the last shade of colour. You can flaunt them in front of your friends in the 16-player social hub, Launch Bay, too. There is a mysterious power at the heart of the game’s narrative, and it is this that has shaped the world you’ll be flying through. Anthem’s land is said to have been formed by legendary gods and their incomprehensible energy. The remnants of these missing deities are everywhere, in the towering columns and statues and the perplexing dishes that reverberate with humming energy, like ancient speakers set into cliff faces. As far back as our Gamescom 2018 hands-on we’ve admired how Anthem captures the enthralling joy of movement. Find out more about editor Ben’s thoughts on the Ranger Javelin. As a Freelancer, your job is to protect the residents of Anthem’s Fort Tarsis by gadding about in the outside world in your Javelin. The story is alluring to an extent, but seems as thin as you’d expect from a game that’s designed to be repeated. 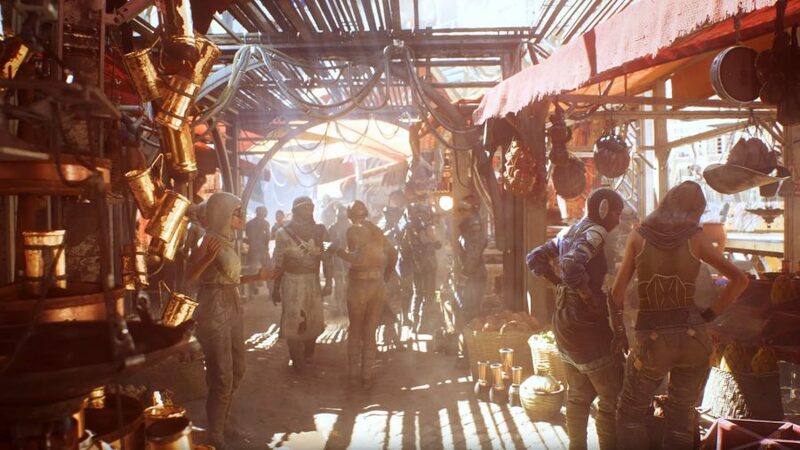 Fort Tarsis is Anthem’s single-player hub, a place where you trade, speak to vaguely irritating NPCs with odd facial animations that are somewhat similar to those in Mass Effect: Andromeda, and hang out with your pals. It’s smaller than Destiny 2’s Citadel and, without much more than subdued chatter, its strangely sterile. Given the developer who built it, that’s somewhat disappointing. For single-player devotees hoping for another Dragon Age or Mass Effect-style adventure, this might not be what you were hoping for. Choices don’t appear to affect much besides how you want your character to express themselves. Think of the base story as a sort of sci-fi-flavoured canvas on which the real stories are told by you and your friends, presumably via the medium of voice chat and slow clap emotes. Like Destiny 2 and the upcoming The Division 2, BioWare’s mech romp is about the joy of the grind. Some will stay just for the story, but there’s more here for players who like nothing better than watching the numbers go up and running missions at the toughest difficulties to bag the best loot. Each hunk of metal and rare weapon on your Javelin shows the shining scars of the times you snatched a boss victory from the jaws of a squad defeat. 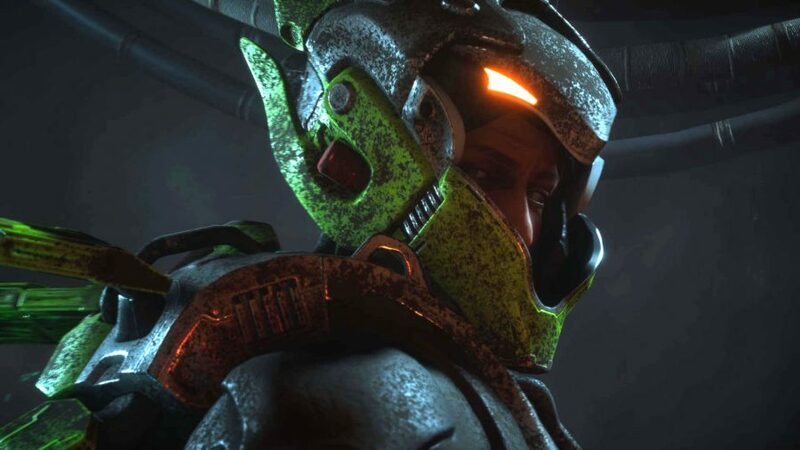 Even as someone who typically resists grind-heavy experiences, I’ll be sinking silly hours into Anthem because I want to master it. I won’t manage it, but I’ll try regardless. When the game’s flying and combat work simultaneously in action-packed harmony, I’m filled with the irresistible urge to perform better, with more skill and grace than the last time. When it comes down to it, I won’t be paying attention to progress bars and weapon stats; in BioWare’s bewilderingly beautiful new world, I’ll be luxuriating in the unparalleled excitement of flight.